American Baptist Missions worldwide as well as local programs. Dr. Bill and Mrs. Ann Clemmer serve in the Democratic Republic of Congo. Rev. Charles West and Mrs. Sarah Clement-West are currently serving in Zambia, Africa. Rev. Rick Barnes and Mercedes Gonzales-Barnes, serve in Baja, CA. American Baptist Home Mission Societies including Rainbow Acres (RA) in Arizona. Amber Morris, a resident at RA, is supported by our church. Locally we support Anne Marie House, Nashua Children’s Home, CareNet Pregnancy Center, Camp Sentinel and Gove Hill. Realizing the importance of scripture in one’s natural language, we support the Wycliffe Translators which includes Dave and Deb Barton currently serving in Papua New Guinea. Ukraine (2 trips) to provide dental and other assistance to those in need. 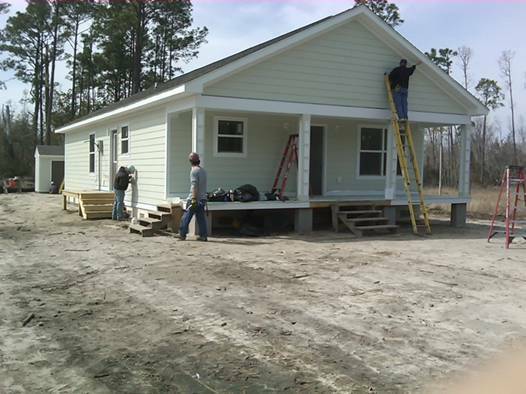 Several trips to the Gulf Coast of Mississippi to help build houses with Habitat for Humanity to assist in the recovery after Hurricane Katrina. Below is the crew from our 2011 trip. 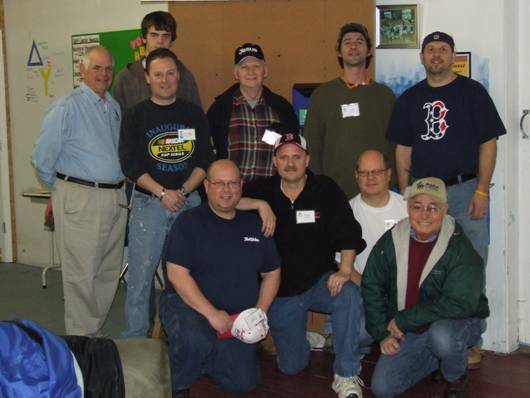 Back to front, left to right: Bob Nealon, RJ Nealon, Craig Bailey, Ed Gotham, Joe Pirroni, Al Daigle, Fred Miller, Tony Rice, Rich Fieler and Rev. Jim Harrington (who retired from our church in 2012). Below that is a picture of one of the homes the team worked on.